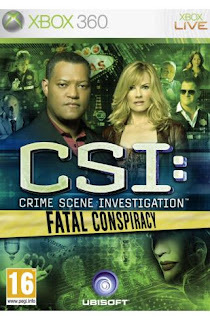 CSI: Fatal Conspiracy is the sixth game in the CSI Las Vegas series. It is the fourth game in the series to be developed by Telltale Games. It was published by Ubisoft for Windows, Xbox 360, PlayStation 3, and Wii on October 26, 2010. Like the other Telltale CSI games, Deadly Intent was distributed traditionally through a publisher to stores. The CSI games remain the only Telltale games that were released through a traditional developer/publisher arrangement. CSI: Fatal Conspiracy is not available to purchase digitally through Telltale's website, but it is available to purchase digitally online through GameFly. This game follows the formula of the other two Telltale CSI games, in that, even though this game was sold as a single product in stores, it still retains the episodic nature of Telltale's other games. This game is different from the other CSI Las Vegas games in that the five cases connect into one larger overarching crime, rather than the final case simply tying into the rest.